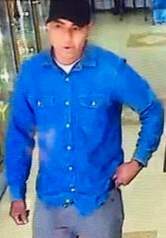 Suspect Description: Male, Hispanic, 5’5, 150 lbs., black hair, brown eyes, black hat, long sleeve blue button-up shirt, white under shirt, gray pants and white shoes. Armed with a black handgun. On 1/22/19, at approximately 9:10 AM, the suspect entered the Norris Food Market (aka Norris Superette Market) in the 600 block of E. St. Andrew Place. The suspect proceeded to purchase several items from the business. After purchasing the items, the suspect loitered in front of the business for several minutes before re-entering the location. Once back inside, the suspect walked to the clerk, displayed a black handgun in his waistband, and demanded money from the register. The clerk refused to comply with the suspects demands and convinced him not to commit the robbery. The suspect left the business; he was last seen walking northbound on Oak Ave away from the business. Anyone with information please contact Detective Corporal Daniel Padron at (714) 245-8545, dpadron@santa-ana.org or Orange County Crime Stoppers at 1-855-TIP-OCCS.